A host of reasons exist for getting your school involved in community/school gardens: students learn all aspects of the food cycle from seed to table and are exposed to key concepts in environment, food production, nutrition and ecology. School gardens teach children where their food comes from and encourage good eating practices by fostering an appreciation for natural foods. Ethno-botanical gardens provide an excellent opportunity to teach students about plants traditionally utilized as food, materials and medicines by First Nations. Students can experience First Nation cultures and traditions in a hands-on manner with activities like planting a Three Sisters Garden of corn, beans and squash. Students gain understanding of natural cycles and the interdependence of all living things. A plot of wheat can teach students the full cycle as they plant, cut, and stook, thresh, grind and bake bread. This activity not only fosters eco-literacy, it encourages a healthy respect for the early settlers by exploring crop production as it was done by pioneers. School gardens and greening projects provide healthier living spaces for the entire community. By encouraging student, parental and community involvement in the planning and maintenance, the school community garden fosters a shared sense of ownership and pride in the school grounds. School gardens and greening projects do not come without challenges. Proper planning and involvement of all the stakeholders during every stage of development will assist in overcoming these barriers. A “team” approach will help to ensure the longevity of the project. The vision may well have been ignited by a single individual but it requires the support and enthusiasm of many people if the project is to be sustainable. Raised beds are more suitable for colder climates and are more manageable. Each of the factors listed above are examined in more detail. Just click on the factor for more detailed information. For a school garden to work effectively, the school will need to develop relationships with the wider community. A neighbor or community member needs to be there when school is out of session and needs to share a sense of responsibility for the gardener and the fruit and vegetables harvested. The school will also need to understand the resources (financial, land, labour, time and commitment) needed to sustain a garden. The kind of garden your school will be able to operate will depend on your climate, the land you can use, the proximity to the school, the size of the plot and the resources you have to put into the school. 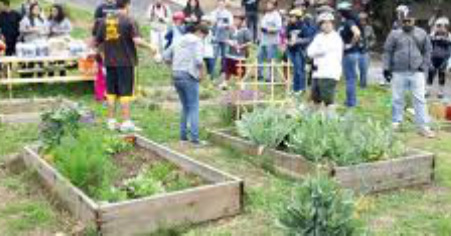 A school garden can be the initiator of a community garden. As such, a school may be the nucleus for starting a community growing food locally. You are more likely to have success with your school garden if it is in raised beds, preferably higher than 40 cm. You will want to locate your garden "out of harms way." Avoid areas of active play. Raised beds located along a fence line that receives little use is a good place, even better if it has a southern exposure. Arrange your beds so they can be covered with plastic to minimize frost damage.